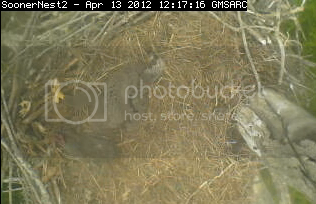 The Sooner nest had another tragedy last evening. It was windy and E1 was trying to escape the bowl yet again. Mom tussled with both lets and stomped on him inadvertently. There's some thought that she may have stabbed him with her talon. 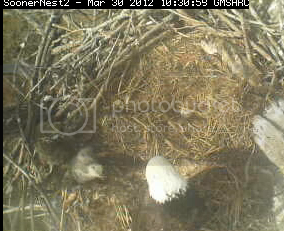 In any event, there was only one eaglet in the nest this morning. There turns out to be another Sooner thread on a site called Window on Wildlife. One of the Sutton chatters posted this animation made with screen caps there. http://www.window-on-wildlife.com/index.php?topic=26.45 Scroll down to the bottom of the page to locate it. Meanwhile everyone at the Sutton site is waiting for Sutton to post their opinion of the accident. 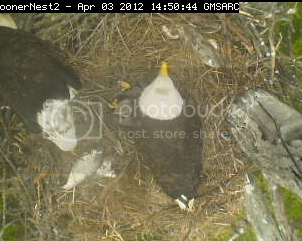 In 2010 when this nest lost two eaglets to falls, Sutton sent people out there and recovered both bodies. 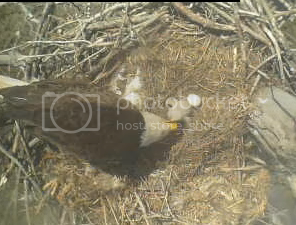 It is assumed they are doing this again, though the body may be harder to find if he was carried off the nest when the parents switched last evening. Mum sooner feds her let at 9.59am . Mum takes a break at Sooner . Let alone . Tonight Sutton posted a long (!) 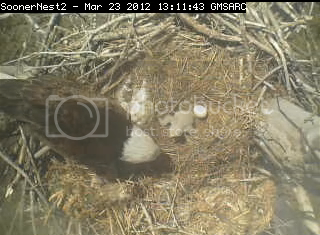 essay on what they thought might have happened to E1 - with an excursion off into falcon nests. I am copying it here. 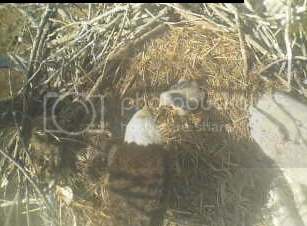 But if you don't want to read the whole thing, basically they are saying they don't think the eaglet was speared by Mom and that they don't really know what happened in the nest that night. 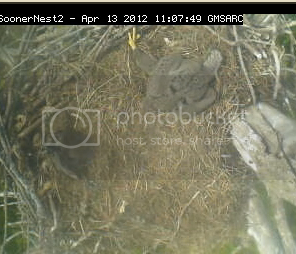 20 March 2012: As most viewers know, one of the young chicks disappeared over the past weekend from the Sooner Lake nest. I have reviewed the clip showing the adult stepping on the chick (http://www.youtube.com/watch?v=xc926dOI1fA). Actually, such incidents are not uncommon in raptor nests, and while the adults usually "ball their feet up" around unhatched eggs and around "just hatched" young, as the chicks begin to grow, parents sometimes step on their chicks accidentally with open feet or when focused on threats near the nest. Usually, the sharp talons do not have any impact on the chicks, as the primary contact is between the pads on the bottom of the adults' feet (rather than the talons) and the chick. I have seen tame, captive adult breeding falcons step on their chicks numerous times, perhaps over one hundred, but have never seen a puncture as a result from such accidental "pressure" treading by a calm falcon. Captive breeding falcons that are wild, on the other hand, can accidentally step on their chicks and do serious damage when trying to protect them from a human intruder. For the falcons, extent of damage can be affected by the substrate beneath the chick that is pressed by the adult's foot. Falcons do not build stick nests as do eagles, but instead scrape out a depression in the dirt where they can lay, incubate, and hatch their eggs. In captivity, their scrape or depression is excavated from about six inches deep of quarter-inch pea gravel. 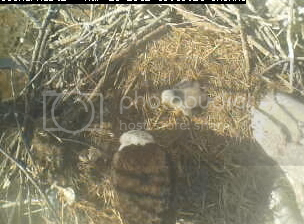 This gravel gives away slightly beneath the chick that finds itself occasionally beneath an adult foot. 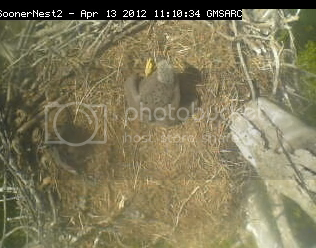 The nest lining in an eagle nest serves the same purpose. 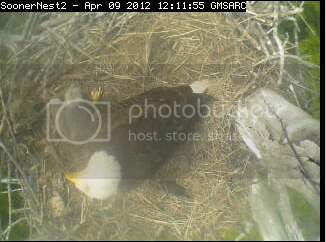 It pads the incubated eggs from the sticks comprising the nest, and it also pads the chicks that lie beneath the brooding adult. 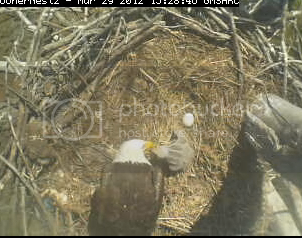 Therefore, the lining helps pad the chick that might be "stepped on" by an adult eagle. The eagles we are observing were not upset and were not protecting their young; instead, they were going about daily life in a calm manner. 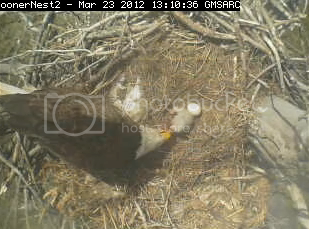 In my opinion, the eagle chick that was momentarily beneath the eagle's foot suffered no damage. 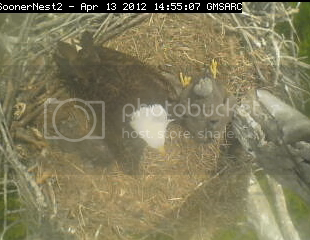 And, it is normal for the adults to reach down and "scoop" the chicks back underneath them by using the adult's beak. The fact is that we really have no idea about the cause of what happened to the deceased chick, and we will probably never know. It is important to refrain from deriving conclusions when we have little or no evidence regarding cause and effect. That is why we need sample sizes with many observations before we can draw conclusions. It is documented that adult birds become better parents with age and experience as evidenced by their increased number of annually fledged young. We are sorry we cannot offer any more definitive answers in this case. We know only that young eagles sometimes die in the nest for a variety of reasons. 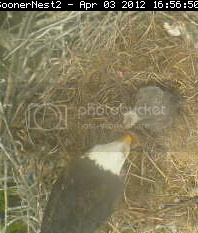 7.35am Eaglet gets a feeding . 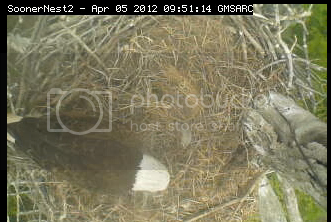 8.28am Mum Sooner feeding let again . 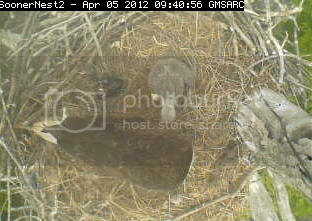 10.03am Eaglet gets fed again. 12.41pm Little one gets fed again . Another fish delivery for sooner . 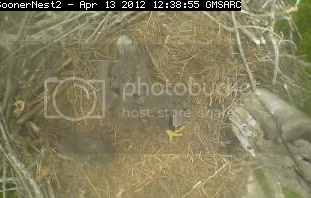 Rabbit arrives on nest at Sooner . The let gets a feeding. So now I am going to pick up the story again. I have been making scaps while Sparkie is on her world voyage but haven't found the time to post them! Too busy watching the excitement of the new Hornby cam, the drama in Minnesota, the darling Decs, more drama at the NYU hawk nest - and it goes on and on and on! 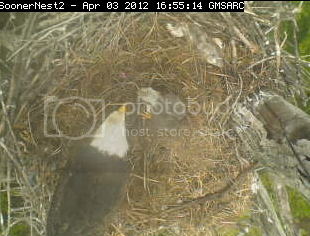 The eaglet is noticeably larger and the down on his shoulders is starting to darken. 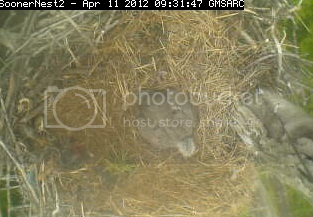 The next day, Friday, March 30, 2102 - Eggbert still has his Dudley egg for company. Another feeding. Larder is full at the start. Mom ripping into a fish. Then Dad shows up with more! Maybe if I were to examine some of the scaps I have made right next to each other I might be able to tell Mom and Dad apart, but this overhead view makes it pretty difficult. So forgive me if I say Mom is feeding all the time. I just don't know any better. 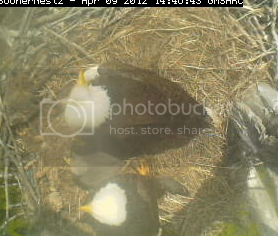 We start with the whole family in the nest. I think Mom is in the center. Then we have a good shot of a big foot! And here the parent has done a very good job of burying Dudley - and also Eggbert I think! But Eggbert wants Dudley with him and has gotten himself and Eggbert out from under the grasses. What is that food item in the upper left? I can't make it out. All alone. Dudley is buried again. Plenty of food. Eggbert starting to look big! Time to call in the experts. Sutton chatters in a panic because Eggbert is sleeping with his leg out. Someone worries that he has a condition called splay foot. Sent these scaps to our expert for review. Of course, we have all seen Hope and Alexandra and David sleep in just these positions - but not from directly above. So it's hard to tell how natural this is. AJL thinks he just fine. She wants me to get pix of him standing up to poop. This will be a challenge! 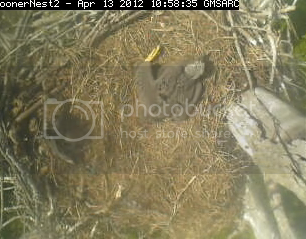 Mom in the nest. Lots of food. Big yellow feet! This Eggbert is a real poser! Note that Dudley is nowhere to be seen. Buried again!